I love pasta. I don’t hate zucchini. I don’t particularly love zucchini either, it’s more like I simply don’t have an opinion one way or another about zucchini. I’ll eat it, and because it’s a vegetable and healthy, I’m trying to eat more of it. But that’s where I draw the line. Do not go messing with my pasta and try to get me to substitute real pasta for zucchini noodles (aka zoodles)! 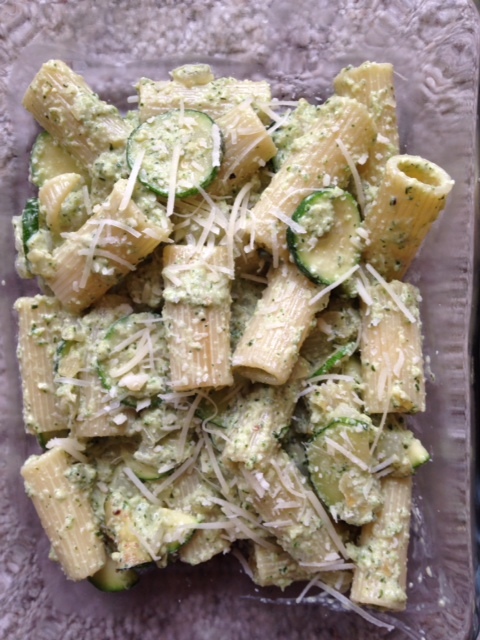 I found a much better alternative — add the zucchini to the actual, delicious pasta. In doing so, you can surprisingly improve both! Case in point: Linguine with Chickpeas and Zucchini from Cooks Country Magazine. Now I’ll admit, when I saw this recipe I thought “Hey, here’s a healthy pasta recipe for the New Year that won’t be too bad.” Wrong, it was amazing!! I mean, like, seriously delicious. It is so easy, and comes together so quickly but seems so much more complex than the few simple ingredients would suggest. So if you’re trying to “lighten up” your pasta without replacing your pasta (cause that would be really sad in my book), try this. It is a definite winner. Bring 4 quarts water to boil in a Dutch oven or large pot. Add pasta and 1 Tbsp salt and cook, stirring occasionally, until al dente. Reserve 1/2 cup cooking water, then drain pasta. Heat oil, garlic, pepper flakes, 1/2 tsp salt, and 1/2 tsp pepper in now-empty pot over medium heat until garlic is lightly browned, 3 to 5 minutes. Add zucchini and chickpeas and cook until zucchini is wilted and most of its excess moisture has cooked off, about 6 minutes. Using potato masher, lightly mash chickpeas. Off heat, stir in 1/2 cup Pecorino, parsley, lemon juice, pasta and reserved cooking water. Serve, passing lemon wedges, extra oil and remaining 1/2 cup Pecorino separately. That does not mean I can go crazy and have sausage-laden, cheesy, ooey-gooey pasta every week (I, do not run). I still want a meal that I won’t regret eating come Saturday morning. That is why I absolutely love this Linguine with Chickpeas and Zucchini that I found in Cook’s Country magazine. It tastes creamy and rich due in part to the partially smashed chickpeas and grated zucchini. There’s also just enough cheese to satisfy without making it seem heavy. All around the perfect summer pasta. You know it’s good when hubby decided to freeze the leftovers to have again this Friday when I won’t be home to cook! Bring 4 quarts of water to boil in a Dutch oven. Add pasta and 1 Tbsp salt and cook, stirring occasionally, until al dente. Reserve 1/2 cup cooking water, then drain pasta. Heat oil, garlic, pepper flakes, 1/2 tsp salt and 1/2 tsp pepper in now-empty pot over medium heat until garlic is lightly browned, 3 to 5 minutes. Add zucchini and chickpeas and cook until zucchini is wilted and most of its excess moisture has cooked off, about 6 minutes. Using a potato masher, lightly mash chickpeas. Off heat, stir in 1/2 cup Pecorino, parsley, lemon juice, pasta and reserved cooking water. Serve, passing lemon wedges, extra oil, and remaining 1/2 cup Pecorino separately. Weekly Winner: All Aboard the Buffalo Zucchini Boat Bandwagon! I’m not even sure where to begin with this recipe. I thought my last entry was odd. It honestly was nothing compared to this one. I remember thinking when I saw the recipe for Buffalo Chicken Zucchini Boats “Wait, what? This doesn’t make any sense! Who thinks up these things? ?” But something about it intrigued me and I could actually envision it working out. I’m not sure why, but the thought the zucchini being stuffed with a buffalo-spiced chicken mixture was weird enough, that it just might… maybe… work out. And it really did! This is a super tasty, satisfying, amazingly easy dinner. It feels indulgent and almost like a cheat meal since you’ve got buffalo sauce and cheese but actually it’s quite healthy. The recipe for Buffalo Chicken Zucchini Boats comes from The Wholesome Dish blog which I discovered in a listing of 20 recipes using ground chicken (yeah, this is the kind of stuff I stay up nights looking at!). Anyway, its crazy-easy — four ingredients! OK, full disclosure mine had 5 since I thought some chopped celery would be a nice addition as celery and buffalo wings go hand-in-hand. It worked great but would be fine without it too. Preheat oven to 400F degrees. Spray a 9×13 inch baking dish with cooking spray. Place a large nonstick skillet over medium-high heat. Add the chicken and break it apart with a wooden spoon. Cook for 7-9 minutes, stirring occasionally, until the chicken is cooked through. As the chicken cooks, cut the zucchini in half, lengthwise. Use a spoon to scoop the seeds and center out of each zucchini half, leaving a 1/4-inch thick zucchini boat. Place the zucchini in the baking dish cut-side up.